Spring is right around the chilly corner. The 2015 class of Appalachian Trail thru-hikers will soon be hitting the Trail northward from Springer Mountain. Quite often friends and families gather together to encourage loved ones who are starting their trek. We hope this brief list of fabulous bed and breakfast inns (B&Bs) in the Northeast Georgia Mountains will help you find a special place for your fond, temporary farewells. These B&B ideas come from our friends with the Northeast Georgia Mountains Travel Association. They always have great tips on the best places to enjoy spending time without necessarily spending a lot of money. Bed and breakfast inns are special places to get away that offer an entirely different experience than cookie-cutter motels. At B&Bs in Northeast Georgia's mountains, you're truly guests, not simply occupants of a room with iffy towels and TV clickers that are more germ infested than most CDC labs. Cozy. Comfy. Friendly. Fascinating get-aways. B&Bs are entirely different from places where you try to sleep by a busy freeway with a breakfast menu that consists of soggy cereal in a tiny Styrofoam bowl. B&BS are mini vacations that you'll remember long after most sleazy motels are plowed down to make room for another car lot. When you need a break - when you REALLY need a break - pick one of Northeast Georgia's lovely B&Bs with one-of-a-kind decorations and fabulous attitudes. Enjoy a delicious homemade breakfast (that someone else makes for a change), have a quiet conversation (without you-know-who bothering you) in a spot with beautiful views and not-so-strange strangers. Here's a B&B you might like: Your Home in the Woods Bed & Breakfast Inn serves oatmeal from baked peaches and locally sourced blueberries. Foodies will love their apple cheddar quiche and "creamy eggs" -- scrambled eggs with cream cheese and Dijon mustard. Going with a fussy eater? Don't tell him or her what's in it and watch as it's munched down faster than you can say, "I knew you'd like it." All of Northeast Georgia's B&Bs are above average, of course, and many use local foods to add a gourmet twist to their breakfast offerings. Twin Creeks Bed and Breakfast Inn, for example, makes a blueberry, cream cheese and croissant casserole. Their signature dish is a carrot-cake Belgium waffle with cream cheese, cinnamon sugar butter and sublime syrup. 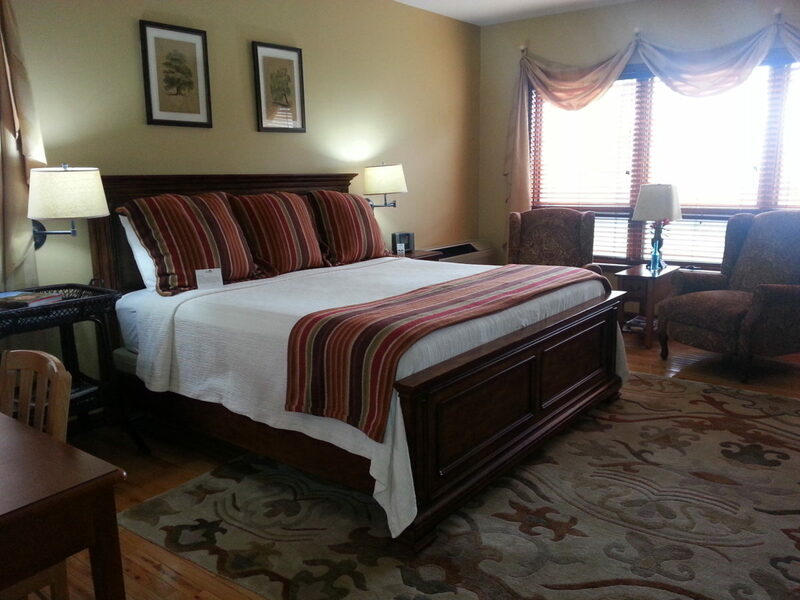 The Misty Mountain Inn B&B includes a full breakfast with fresh ground coffee and juices. Daily offerings vary, but think of ... a country breakfast with home fries and scrambled eggs with diced ham. Add in a few cheeses, bacon, biscuits and toast with jams, jellies and locally produced honey and you'll have a good idea of what's for breakfast. Or select a vegetarian quiche, a breakfast sausage casserole, waffles and pancakes or simply delicious coffee with a loved one. Glen-Ella Springs is a fabulous place for dinner or to spend the night ... followed by breakfast and appreciation. If you're adventurous, take a drive around magnificent Lake Rabun - be sure to notice the unique boathouses - then, stop by for a quick hike up Minnehaha Falls (honest). Afterward, head down Bear Gap Road, the back way to Glen-Ella Springs. Just when you-know-who is absolutely sure you're lost and promises himself/herself never to trust you again, say, "Oh, no! We're almost out of gas and we have no food! We're going to die in the wilderness!" Keep driving few miles through deepest, darkest Georgia to Glen-Ella Springs. Park and go inside where you'll say, "We have dinner reservations!" Everyone's favorite culinary masters at Glen-Ella delight guests with their Two Cheese Strata served alongside creamy stone-ground grits from Nora Mill Granary of Helen, GA. Count me in for country ham and made-from-scratch biscuits. Unless they're serving Caramel French Toast Casserole and Mini Herb Egg Muffins. Tough choices. Everything at Lucille's Mountain Top Inn & Spa - truly one of America's finest - is fabulous. If you've never been treated like royalty, Lucille's is your big chance. If you've never seen a sunset or sunrise in the Northeast Georgia mountains, Lucille's is your big chance. If you've never spent a night in a deluxe room with a couple of robes that probably cost more than your first car, Lucille's is your big chance. If you've never had a gourmet breakfast where the only thing that could possibly intrude upon the delight is trying to figure out which spoon and/or fork to use (trust me, they'll bring you more) ... yup, Lucille's is your big chance. My three-course breakfasts at home - generic V-8 juice, a generic English muffin, generic bran cereal and inexpensive coffee - aren't the same as what you'll be served at Lucille's. In a dining room overlooking the Blue Ridge Mountains of Northeast Georgia, you'll dine on Gruyere and Shallot Frittatas, Creme Brulee French Toast with Minted Strawberries, Pancakes with Spiced Blueberries and a side of thick sliced Applewood Smoked Bacon. I've been to Lucille's Mountaintop Inn. Didn't have a clue what I was eating (sorry), but if I get to choose where I want to eat my Last Meal, take me to Lucille's, please. Pffft. Forget going to the Smokies. Forget motels that have numbers in their names. The next time you need to get away for a little adventure, exploration or relaxation, spend a night -- and maybe the time of your life -- at one of the forty B&Bs providing the best the Northeast Georgia Mountains can offer.